You may want to start playing the guitar, but don’t know where to start. We’ve listed some common questions we hear all the time to point you in the right direction. The first thing we often hear is if someone is too old to start. This often comes from hearing that children learn to play musical instruments very quickly compared to adults. But then, this is only partly true. While it’s true that children pick up new things like sponges, adults can be far more strategic and pointed in their learning. Because of this, anyone can learn to play the guitar! It’s as simple as picking it up and getting started. The first step when starting to learn to play is to find a teaching or learning method that suits you. Some people are visual learners and like to watch videos of lessons. Others are more auditory and like to find the tab of a song and work it out by ear. For most people, having a teacher is a great way to speed up the learning process. Also, having someone show you proper technique from the start can save you lots of time down the road, especially when you have to unlearn bad habits you picked up when you first started. 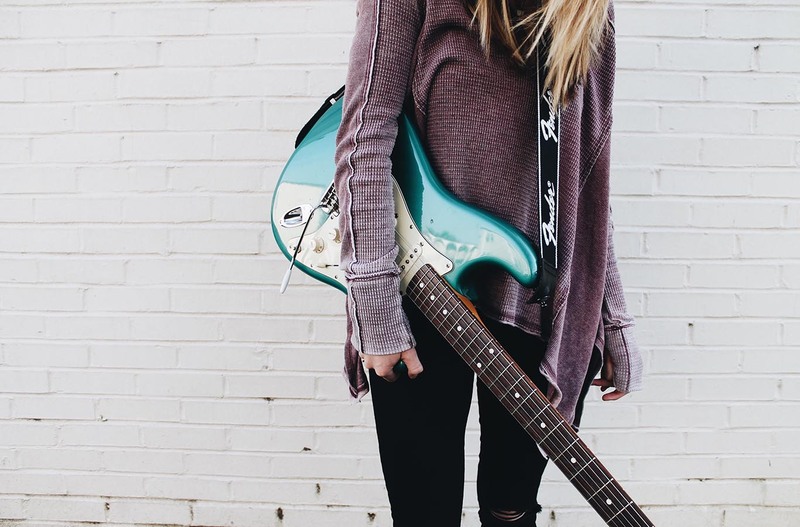 Generally, people think acoustic guitars are easier to learn on, but actually, electric guitars have thinner strings and a lower ‘action’ (the space between the string and the neck of the guitar) which makes them easier to play. But first, learn some tips on how to buy your first guitar. Once you have your guitar, you need the proper strings. The best thing to do here is to visit your local music shop, and ask someone to show you what strings are best for your guitar, and how to string it. You may also be wondering what other equipment you may need, from capos to slides and amps, there are lots of extra gear available. To start with, a small and a few picks are all you really need to get started. After that, you can look at accessories depending on the type of playing style you like, and the music you listen to. Some other accessories that are great to have at the beginning are a strap, which is secured to your guitar so you can stand up while playing it. We also recommend you get an electric tuner that clips onto the head of your guitar. This measures the vibrations of a string to tell you if it’s in tune or not. There’s also a selection of free apps you can use to tune your guitar. Finally, you’ll need a cable to plug your guitar into your amp. You don’t need anything fancy. Just make sure it’s of good quality, and that it’s long enough for your needs.